The Churchill Hospital is a centre of excellence for cancer services and other specialties, including renal services and transplant, clinical and medical oncology, dermatology, haemophilia, chest medicine and palliative care. 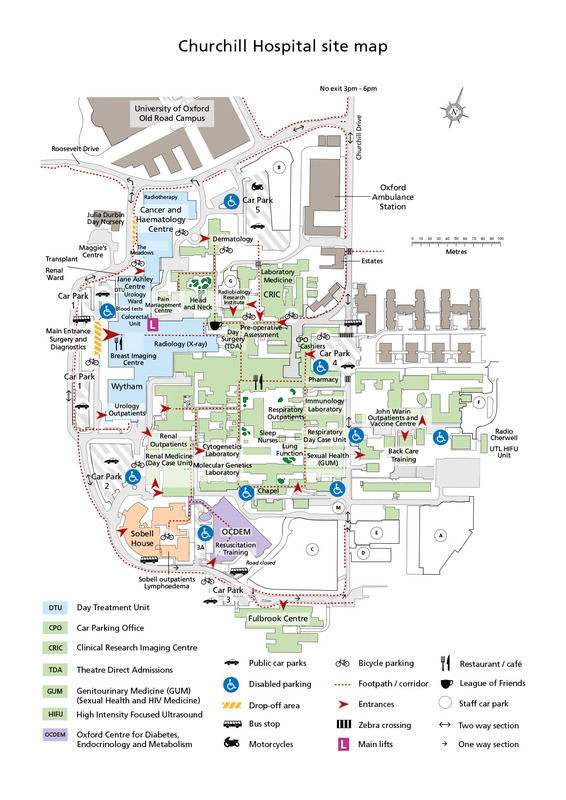 The hospital, together with the nearby John Radcliffe Hospital, is a major centre for healthcare research, housing departments of Oxford University Medical School and Oxford Brookes University's School of Healthcare Studies. It incorporates the Oxford Centre for Diabetes, Endocrinology and Metabolism (OCDEM) - a collaboration between the University of Oxford, the NHS and three partner companies - which is a world-class centre for clinical research on diabetes, endocrine and metabolic disorders, along with clinical treatment and education. the Wytham Wing - housing the Wytham Ward (transplant) and private outpatients. a base for University research teams, working in partnership with NHS colleagues. The Churchill Hospital is supported by Oxford Hospitals Charity.